After a successful, star-studded and country-wide - including Port-au-Prince - 4th edition of the Dominican Republic Global Film Festival (DRGFF), it was fitting indeed that the final movie to enchant audiences in Santo Domingo’s Blue Mall Cinema was the 100% Dominican “3 to the Rescue.” The premiere of this first ever 3D animation film was met with pure delight on the part of the mostly youthful audience. 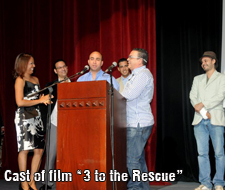 “3 to the Rescue” tells the warm-hearted story of Frank the chicken, Mauritius the pig and Enrique the goat who run away from their farm on Christmas Eve to avoid being turned in the holiday feast. They soon meet up with Bilpo, the iguana, who rescues them from various situations as they adjust to a new world and their new freedom. Soon, the Claw, a ruthless poacher who tracks and sells endangered species, kidnaps Bilpo. The three farm animals, driven by a sense of loyalty and gratitude, follow the kidnapper’s trail to Santo Domingo where, with a group of captured animals, they carry out the riskiest and most dangerous rescue operation ever undertaken. The crisp 3D animation and joyful voice talent of the characters, along with the snappy music has the packed cinema in a collective good mood. The local humor, while perhaps lost on some of the international guests, sat well with Dominicans who at times roared with laughter. Co-Director Luis Manuel Morillo, a graduate of APEC and the University of the Caribbean, has won several awards for his digital animation including one for the most creative digital idea developed in the area of fluid simulation for visual effects from the CG Society (society of digital artists). Co-Director Jorge Luis Morillo, Industrial Designer graduated from the Institute of Technology of Santo Domingo, has worked as director, producer and VFX Technical Director on feature films, commercials and multimedia presentations. Both young Dominicans are known for their state-of-the-art multimedia formats and technologies. This year’s Festival screened over fifty movies and eleven Dominican-made short films in 6 venues around the country and in Port-au-Prince, Haiti as part of the DR’s continued support of its neighbor. The DRGFF hosted filmmakers, actors, directors, writers, journalists and film industry guests from around the world who sat, side-by-side, with enthusiastic Dominican audiences to view some of the world’s best cinema. Film retrospectives from France, Haiti and Australia also garnered special attention from the many film buffs who attended this year’s Festival. As part of the DRGFF, the Short Films Competition which is now in its second year, chose three winners out of an initial group of 50 entries later narrowed down to eleven. The first place winner of this year’s competition was: “Mi papa esta en el cielo” (My Dad is in Heaven)by director Francisco Rodríguez. 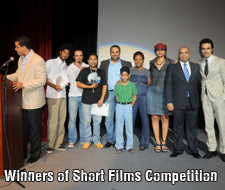 Francisco won a video camera, a scholarship to study film in Los Angeles, California and the opportunity to make a short film there under the auspices of the Dominican film production company, Panamericana. Second place winner was “Morir en Montecristo” (To Die in Montecristo) by director Frank López received an iMac. And third place went to director Franmiris Gomez Lombert for “Correspondencia” (Correspondence). Franmiris took home an iPad. All eleven finalists in the Short Films Competition had the opportunity to have their films screened at this year’s Dominican Republic Global Film Festival (DRGFF) as openers at every screening around the country. The films had a great deal of coverage and were well received. In addition to movies, there were film-related panels, workshops and round-table discussions before and after many film presentations. Dominicans received advice, encouragement and practical training from professionals from around the world whose workshops included digital 3D classes, film history reviews, acting classes, make-up and special effects displays, documentary making, etc. All workshops were free of charge and open to the public. To help with the enormous task of organization and preparation, over 300 Dominican young adults gave up their time and volunteered in all areas of the festival, all around the country. DRGFF organizers thank these dedicated volunteers and look forward to working with them again next year. The Dominican Republic Global Film Festival (DRGFF), the Fundación Global Democracia y Desarrollo (FUNGLODE) along with its sister organization in the U.S., the Global Foundation for Democracy and Development, would also like to thank everyone who participated and attended this year’s Festival, including our many sponsors, and in particular DRGFF Honorary President, Leonel Fernandez. The Festival contributes to raising awareness and understanding of global issues through stories about events and people that have left a mark on our lives. 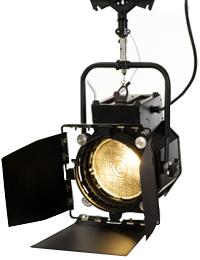 It uses film as a way to promote and encourage discussion about social issues, politics and economics. The Dominican Republic Global Film Festival seeks to enrich the country’s film culture and to bring the seventh art into all sectors of Dominican society. In addition to being organized by non-profit organizations, the DRGFF is distinguished for its role in promoting the Dominican Republic as an excellent location to make and produce films, thus contributing to the country's economic growth, competitiveness and already rich cultural traditions.